Use of a Murti as an Object of Worship is an Ebook in PDF format which includes detailed instructions on building and using an altar with Murtis for your devotional practices. Also includes all precise instructions on how to perform specific devotion as taught at Vishwa MahaDham, including mantras and step by step instruction. These instructions include all details of performing the Arati Ceremony. 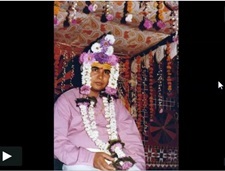 See our ARATI BOOK download for more support with this ritual. Download contains a 20 page PDF file with all the above and pictures of Shri Babaji.